A beautiful example of A. J. Johnson's 1866 map of Florida. This rare map offers a fascinating snapshot of this secessionist state shortly following the close of the American Civil War. Map shows the state in full with color coding according to county. Cartographically this map is probably based on U.S. Land Survey charts commissioned in the mid-1850s. Makes numerous references to American Indian tribes and to forts and battles sites related to the Seminole Wars. Notes Lake Okeechobee, the Everglades, the Indian Hunting Grounds, Biscayne Bay, Tampa Bay and the Okefenokee Swamp. Also shows the course of a proposed canal route leading from Tampa to the Atlantic. The Arredondo Grant is included just to the west of St. Augustine. The Arredondo Grant was a layover of the Spanish Land Grant program, which bequeathed it to a powerful Spanish merchant - Arredondo. 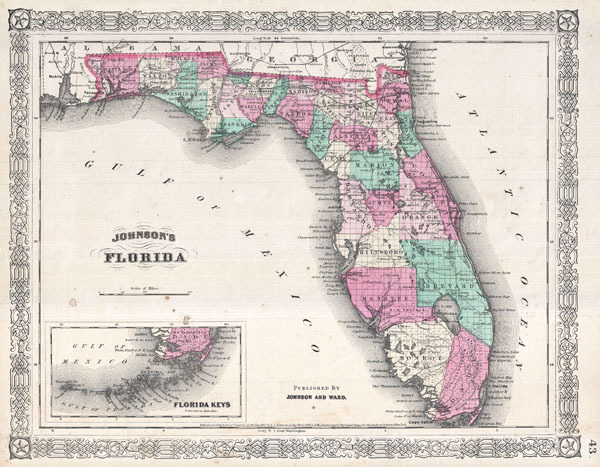 With incredible difficulty and protest, the land grants were dissolved when Florida became part of the United States. Nonetheless the Arredondo Grand proved tenacious appearing on mappings of this region well into the late 19th century. An inset map in the lower left hand quadrant details the Florida Keys. Features the fretwork style border common to Johnson's atlas work from 1863 to 1869. Published by A. J. Johnson and Ward as plate number 43 in the 1866 edition of Johnson's New Illustrated Family Atlas. This is the last edition of the Johnson Atlas to bear the 'Johnson and Ward' imprint. Very good condition. Verso reinforcement in upper left quadrant. Blank on verso. Rumsey 2905.019 (1860 edition). Phillips (Atlases) 6140-30.